Leading Manufacturer of imprimante 3d printer from Delhi. We are engaged in presenting an extensive series of Imprimante 3D Printer or FDM 3D Printer, which is developed by proficient professionals using the quality permitted material and advanced technology. These products are obtainable in numerous specifications that meet on industry standards. Apart from this, these products are checked by quality controllers in order to deliver fault-free series to the customers. 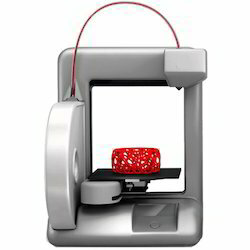 Looking for 3D Printer ?